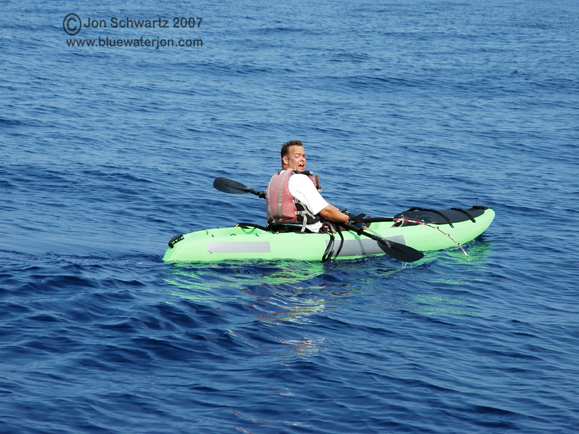 by Jon Schwartz aka "Bluewater Jon"
In July of 2005, I took a trip to the Big Island of Hawaii to continue my quest to pitt myself against huge fish from a kayak. 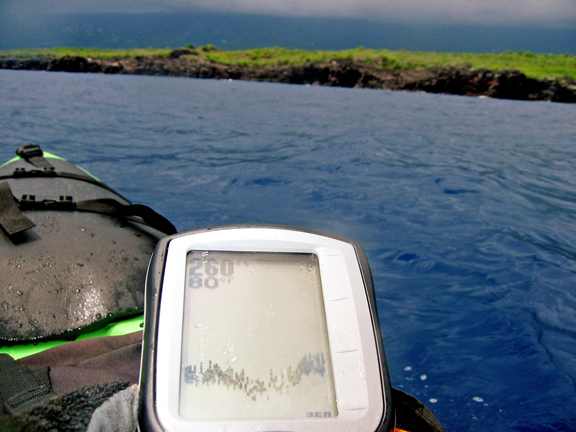 I planned to paddle into Kona’s “Land of the Giants”, where monstrous beasts prowl the deep blue abyss just offshore. This is a place where you can be 50 yards offshore, and in 300 feet of water! These fertile fishing grounds play host to an incredible variety of fish, including 1000 pound “grander” marlin, huge tuna, wahoo, dorado, giant trevally- and plenty of sharks, including the notoriously feared tiger shark. These apex predators can grow up to 2000 pounds, and unlike great whites of similar size, are known for their propensity to roam shallow coastal waters. For the two previous days, I had hired a boat and film crew to get some footage of me kayak fishing. 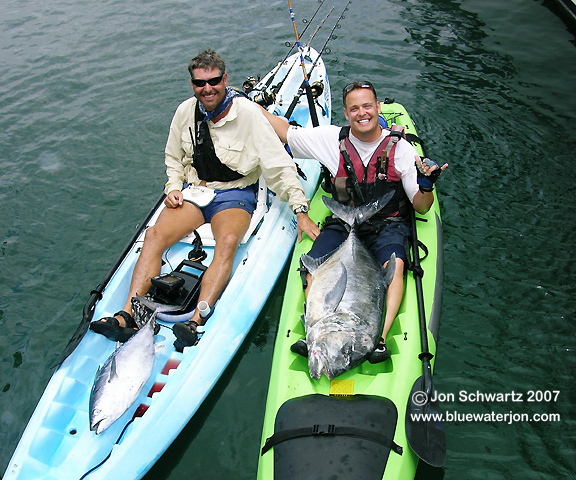 The footage from the entire trip would eventually make its way into my kayak fishing DVD adventure movie, Bluewater Jon and the Giant Tuna. 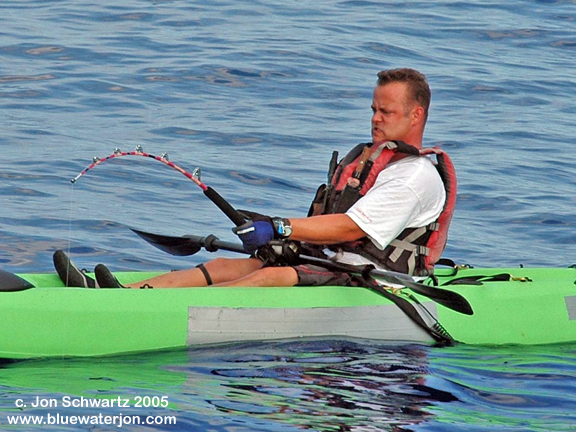 This day, though, I had planned to launch from shore with my friend Steven, who had helped me plan my adventure. His knowledge of the local waters and fishery would prove invaluable to me, and I looked forward to sharing the day with him on the high seas. 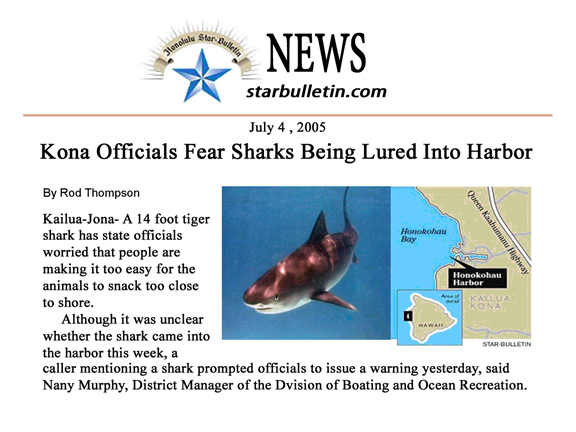 Upon reading this, I had considered changing our launch site, but subsequent conversations with local captains convinced me that sharks could be anywhere, so it was either deal with the possibility or twiddle my thumbs at the hotel. Steven and another local kayaker named Mike had advised me that some sort of protection against sharks was a good idea. Mike’s solution was a home made bang stick, a last ditch resort to be used in the case of an impending attack. Steven told me that other kayakers carried with them state of the art devices which deterred sharks by emitting electrical pulses that interfered with the jelly filled sacs in the shark’s snout called Ampullae De Lorenzini. He had yet to invest in one, and relied instead on a home made spear that could be used in close quarters. Launch time was set to precede the armada of boats that regularly leave the harbor at 7:00, and on our way out, we did our best to stay clear of boat traffic. More than a few boats cruised unnecessarily close to us at full throttle, creating huge wakes that bounced us around in the channel. There was no mistaking this place for cozy La Jolla; between the terrible tiger sharks, marauding marlins, dizzying drop-offs, and brazen boat owners, our place in the pecking order was made abundantly clear. In the Land of the Giants, we were just above baitfish in the food chain! Steven films his fishing exploits with a camera that he mounts to his headgear, and he’d be filming today’s events. We’d be using different baits and gear. Steven had a time-tested special rig that he used to hook the fresh opelu bait that he bought from the market, and I opted to try my luck with the 15” sushi quality mackerel that I brought over from the mainland. While Stephen trolled with spinning gear, I was using a TLD-15, which is a lever drag open faced reel, loaded with 30 pound test. The kayak that Steven paddled was a behemoth, and glided well, but I had rented a short kayak that had all the action of a tug boat. 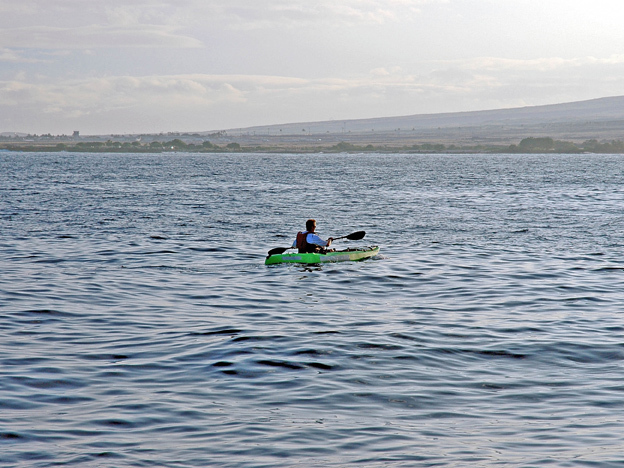 As soon as we left the harbor, we began paddling into a stiff current. I sure didn’t want to look like I was having trouble keeping up, so I hid my struggles beneath a wide grin, all the while hoping that he would stop for a spell. Eventually we stopped to chat a bit and drop some baits down. Due to the size of the baits I was trolling, my line had become terribly twisted, to the point where I had to redo another rig right there on the spot. Steven politely offered a premade leader of his own, but I declined, partly out of pride, and partly due to the fact that I was partial to circle hooks. Fortunately I had brought me with me some special knottable wire leader, and I was able to fashion a dropper loop with an 8 ounce weight in relatively short order and drop it down. 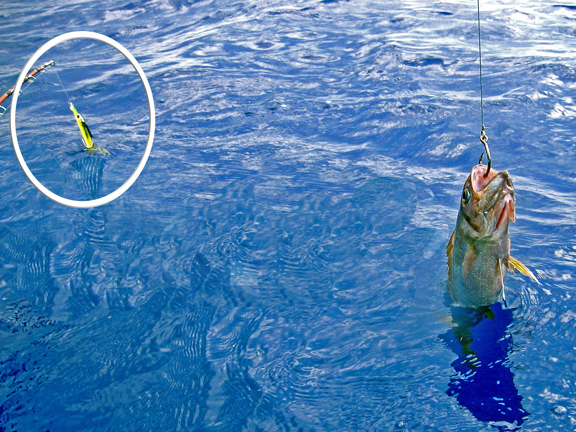 Having lived in Hawaii for several years, Steven had picked up some of the traditions and lingo of the local Hawaiian culture, and when his bait got hit by a fish, he yelled out, “Ha’napaa!” which means hookup in Hawaiian. He fought the fish well, keeping a deep bend in the rod, and I watched with a mixture of excitement and jealousy as he gradually brought the fish up to the surface. The fish turned out to be a Kawa Kawa (a local tuna) in the 15 pound range, and I watched with keen interest as he boated the fish by piercing it with his spear and placing the “stoned” fish in his lap. 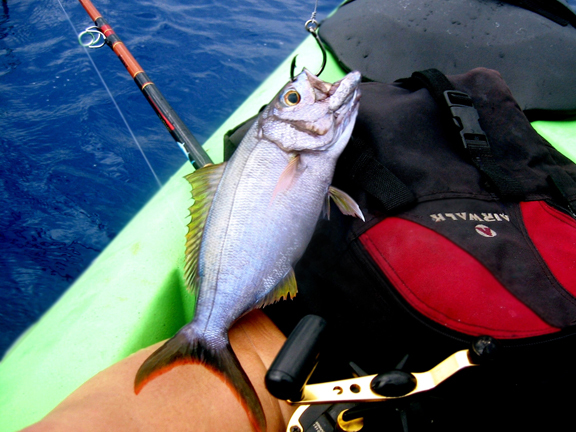 I paid close attention to his technique because I had dreams of battling a huge yellowfin tuna from my kayak, and I needed something that would help me deal with it if I was able to raise it up to yakside. I had gaffed tunas in the 40 pound range before, and concluded that it would be folly to gaff one much larger because it’s like attaching yourself to a wild bull, so I needed some way of disabling the tuna without endangering myself any more than I had to. The spear proved to be quite effective, and I saw that it might allow me to deliver multiple blows to a giant tuna, but something also became readily apparent- it left a lot of blood in the water! As soon as he poked the fish it acted like a warplane in a dogfight that had been shot out of the sky, trailing a bright colored plume that quickly turned the water between us a brilliant shade of red. “Hey, uh, Steve…. so, like, what’s the plan if a tiger shark shows up?” I asked, trying my best to feign only a slight interest in the fact that we had just rang the dinner bell. “We’ll stick together and make sure that he knows that we’re not bait…” replied Steve. Ok, cool. I can dig that, I thought. Teamwork. Attitude. Watch each other’s back.. That’ll do the trick.. Problem solved! Steve placed the tuna on his deck under a wet cloth and we resumed trolling, all the while keeping a conversation going on our marine radios. Within five minutes, Steve’s screaming “Ha’Napaa!” over the radio, and he’s hooked up again, but this time, it’s for real- he’s getting towed all over the place. He looked like character in one of those Benny Hill skits where he goes haywire in every direction! “Dude, what are you on?” I screamed over the radio, trying to sound like I was happy for him. The truth was that I was green with envy! “What is it? What is it?” I begged. Of course the first thing that comes to mind for me was, glad it’s not me over there! And then it occurred to me that we had just formed a sacred pact of allegiance, and that I was duty bound and morally obliged to paddle over there as fast as possible and, uh, let the shark know that Steve, or rather, we, weren’t bait. All for one and one for all, you know. Show the shark who’s boss, take no guff, that sort of thing. Resigned to my fate, I began to paddle as fast as I could, all the while hoping that whatever was going to happen would be over before I got there. I was within 100 yards of Steven when he announced, “He’s gone, he’s gone, I’m pretty sure he’s gone,” and I breathed a huge sigh of relief. Just as I slowed down my paddling, my reel makes a high pitched whine that shocked me in its ferocity and sense of urgency. By the time I had grabbed the rod, a Seeker 60 pound roller guide model, the line was racing off the reel, and I carefully eased up on the drag so as not to let the fish snap the line. This was no regular fish, it was a monster! The fish immediately began to drag me at a furious pace toward the rocks near the shore, and waves crashed off of my bow as I struggled to maintain my balance. Our roles now reversed, Steven barked into the radio “Jon, what are you on? Don’t let him drag you into the rocks!” and as I looked over my shoulder I could see him paddling furiously, trying to catch up to me. As the fish continued to take line at will in frightening bursts, I began to doubt that the reel and line I was using could handle the fish. 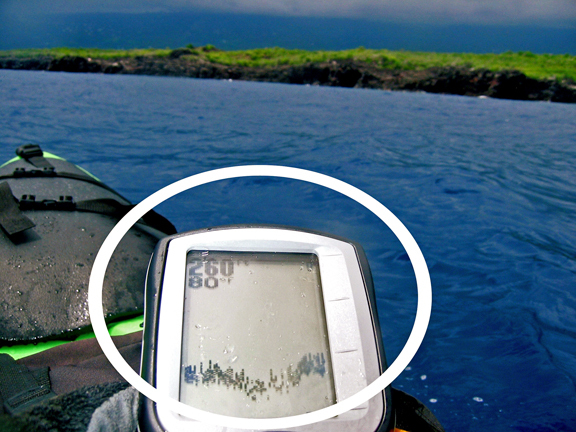 My portable fishfinder indicated that I was now in only 60 feet of water, and the battle now hung precariously in the balance. I could tell the fish was trying to drag me to his favorite hole, and if I let him, he’d take one last terrific lunge, the line would snap on the jagged corners of his craggy crevice, and I’d be brokenhearted! I decided to call the fish’s bluff and go into overdrive, drawing on my energy reserves, and cranking on him as if I didn’t care if I got him up. The plan worked; he stopped swimming towards the rocks, and instead began to head out to sea, much to my delight! This was a mistake I was determined to make him pay dearly for. I tightened down the drag even further and let him take me for a long ride, knowing that he couldn’t handle a horizontal fight in the open ocean, and after several hundred yards, I had color. By this time Steven caught up to me, and was filming the entire spectacle. The fish was absolutely huge! It turned out to be a giant trevally, or ulua in Hawaiian, known worldwide as one of the most brutal fighters and tenacious opponents. It was exhausted, and as I was unsure as to what I was going to do with it, I gingerly placed a gaff underneath his massive gill plate and kept him at yakside. He was exhausted to the point where he would need some serious reviving, and I mulled my options. Steven warned me, rightly so, that a revival effort at yakside, which would entail pushing the quivering giant back and forth through the water, could be foolish as it would act as a dinner bell to the tiger sharks that were still around us, so I decided to take it in and donate the fish to one of the local families I knew who could use the meat. As we paddled in, I felt a huge sense of joy that we had shared such a great day on the water, and an equally great sense of relief that we had managed to escape the Land of the Giants unscathed. 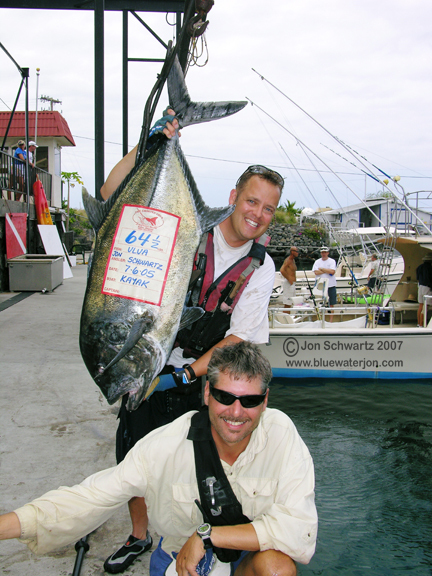 The fish came out to 64.5 pounds of the official scale, and made it on the Big Fish list for Kona that year. 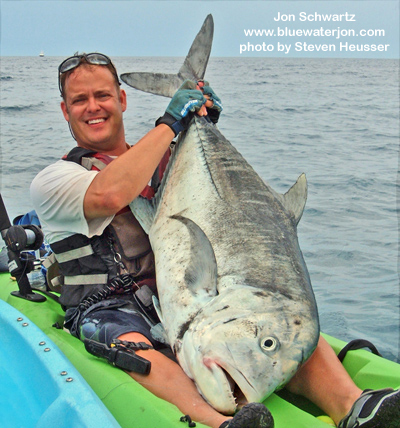 This entire episode, along with many other wild and crazy tales of adventure, are chronicled in my 57 minute long kayak fishing DVD movie Bluewater Jon and the Giant Tuna, available through www.bluewaterjon.com.